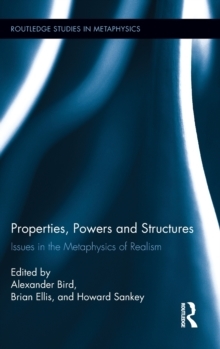 While the phrase "metaphysics of science" has been used from time to time, it has only recently begun to denote a specific research area where metaphysics meets philosophy of science-and the sciences themselves. The essays in this volume demonstrate that metaphysics of science is an innovative field of research in its own right. The principle areas covered are: The modal metaphysics of properties: What is the essential nature of natural properties? Are all properties essentially categorical? Are they all essentially dispositions, or are some categorical and others dispositional? Realism in mathematics and its relation to science: What does a naturalistic commitment of scientific realism tell us about our commitments to mathematical entities? Can this question be framed in something other than a Quinean philosophy? Dispositions and their relation to causation: Can we generate an account of causation that takes dispositionality as fundamental? And if we take dispositions as fundamental (and hence not having a categorical causal basis), what is the ontological ground of dispositions? Pandispositionalism: Could all properties be dispositional in nature? Natural kinds: Are there natural kinds, and if so what account of their nature should we give? For example, do they have essences? Here we consider how these issues may be illuminated by considering examples from reals science, in particular biochemistry and neurobiology.